Michael-In-Norfolk - Coming Out in Mid-Life: Are Julian Assange and Wikileaks A Russian Front? Assange, an enemy of the United States whose organization, WikiLeaks, is fronting for the Russian intelligence services. Hannity, of course, is not only an ignoramus but a hypocrite whose views shifted when WikiLeaks broke into the Democratic National Committee and Hannity’s idol, Donald Trump, applauded the attack on the Democrats. But Hannity is not alone. Various people and groups, from misinformed college kids to far-right and far-left conspiracy theorists, see Assange as some kind of freedom fighter. No patriotic American should be celebrating the career of Julian Assange. His dissemination of others’ secrets has nothing to do with democracy and transparency, and everything to do with the sordid underworld of international espionage. WikiLeaks is a functional subsidiary of Vladimir Putin’s intelligence services and Assange—hiding in a London embassy rather than face charges as a sexual predator—is on the end of a long but firm Russian string. Assange’s defenders will complain there is no smoking gun linking WikiLeaks and its cult leader to Moscow. There isn’t, but that’s because in the real world things don’t happen the way they do in the movies. There is no receipt in a desk waiting to be found by an eager journalist. No child prodigy is going to hack a phone in five minutes and find a voicemail from a man with a thick Russian accent explaining the exact location of a dead drop. For more sensible people, however, the evidence is damning. First and foremost, WikiLeaks—citizens of the world that they are—never seem able to leak anything damaging to the interests of the Russians. They likewise avoid antagonizing the Chinese or any other autocratic regime that might take umbrage or engage in retaliation. Almost every leak of any consequence is aimed squarely at the United States and its allies, and never as assistance to noble activists anywhere else. Likewise, the involvement of WikiLeaks in the Edward Snowden affair, catalogued ably by authors like John Schindler, Edward Lucas, and others, was so obviously facilitated by the Russians that it should be used as a case study in Espionage School 101. . . . . If you think Assange’s recommendation, Snowden’s arrival, and Harrison’s presence are at all possible without a cozy relationship with the Russian secret services, then you don’t understand how any of this works. The Russian goal is to give American democracy a black eye in front of the entire world, while undermining the faith of average Americans in their own political arrangements. If Assange and the Russians have a dog in this fight, it is Donald Trump, and only temporarily: like any other stooge, Trump has value only so long as he is useful in attaining Moscow’s larger aims. What Trump gets out of this is anyone’s guess, but then again, it is difficult to determine the motives of emotionally unstable people. Despite Assange’s fiery posing, he and WikiLeaks exist at the Russians’ sufferance. 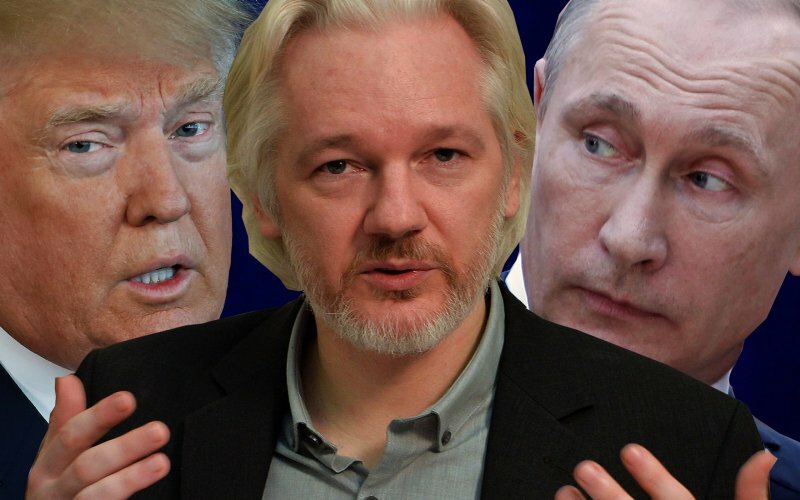 Think of Vladimir Putin and his intelligence chiefs as something like a board of directors, and Assange as their CEO: while the board may not direct day-to-day operations, Assange and his staff nonetheless know what’s required to keep their funding stream, their freedom of movement, their access to the media, and perhaps even to maintain their own safety. There might be some smaller operations here and there at the enterprise’s discretion, but the single focus is always the same: undermine the United States. Russian intelligence and their Wikileaks minions are indeed conspiring against them. Conservatives, liberals, libertarians, and “freedom” activists who applaud these kinds of activities, and who wish for Assange’s freedom, are dupes. They are also sympathizing with their own enemies, which also makes them fools. It even makes them useful idiots, one might even say.